..And when things go wrong, what you should do is make good art. I love this concept. I KNOW this concept. I know this whole speech almost by heart. I basically preach this. It is always the making of the good art that saves you. Or at least it is always the making of good art that saves me. And yet, sometimes I have to be reminded. And strangely, last August, when I was going through some personal hard times, I was continually hearing the chorus of “paint your feelings.” Which, I’ll be honest, is not usually my go to. I make art because I am inspired. And working on good art pieces that I’ve been inspired to create always takes me out of time and makes me feel better. So it’s always a good panacea for emotional pain. But rarely do I actually paint my literal feelings. But, I kept hearing it. So finally one day, slightly exasperated because “what does that even mean- paint your feelings! ?” I sat down at my desk with a blank sheet of paper and my watercolors, and before I knew it, this anatomical heart emerged, along with the Pirates of the Caribbean line that I love so much. Translated to “golden joinery,” Kintsugi (or Kintsukuroi, which means “golden repair”) is the centuries-old Japanese art of fixing broken pottery with a special lacquer dusted with powdered gold, silver, or platinum. Beautiful seams of gold glint in the cracks of ceramic ware, giving a unique appearance to the piece. This repair method celebrates each artifact’s unique history by emphasizing its fractures and breaks instead of hiding or disguising them. Kintsugi often makes the repaired piece even more beautiful than the original, revitalizing it with new life. For Kay, who loves anatomical hearts of all kinds, this painting became immediately tied to her character of Cupid from Tell City. It would seem that once again, and even more unintentionally this time, I had created relevant fan art. Even when I try to make art about my own personal stories, it ties back into archetypal stories somehow or another. Ha! I guess no one can escape their destiny. So yet again, when we sat down to determine what we should use to create Tell City merchandise for fans to rep, we quickly and easily landed on this piece too. Kay wanted the anatomical Cupid heart. So we hunted down a relevant quote from Tell City, I digitized and edited the image to change the text, and for the back I pulled in the Tell City “skyline” from the book cover and decorated it with the same fill pattern as the heart. Et voila! 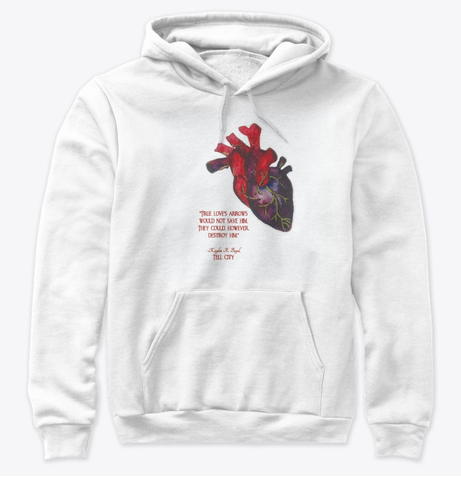 Grab this heart for your own- as a reminder not to lock your heart away, or as a reminder of everyone’s favorite diapered cherub, or as a reminder of whatever else you might bring to the piece. Check it out here! 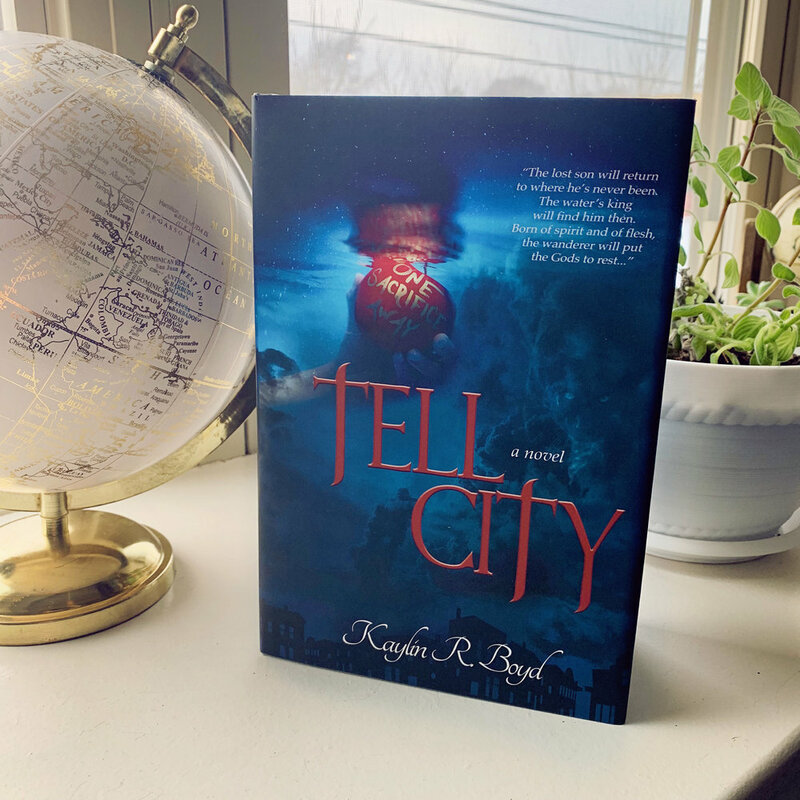 And, if you don’t have one yet, grab your copy of Tell City here! 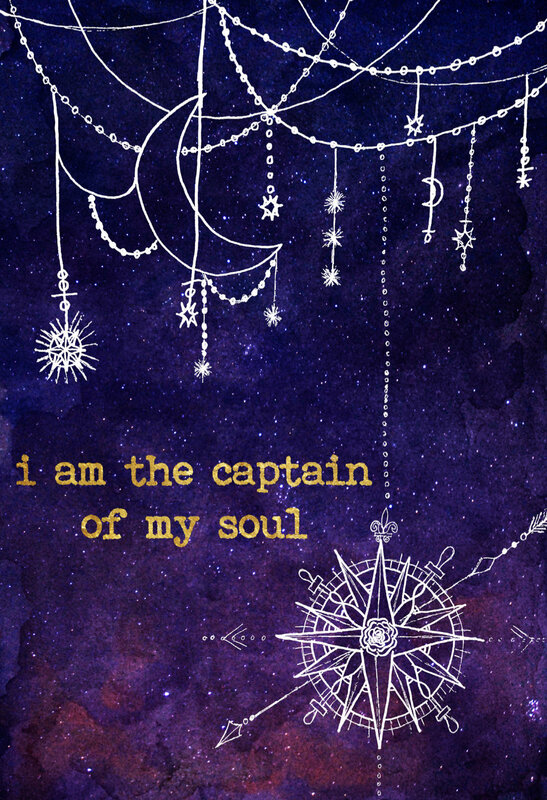 This blog and my artwork runs entirely with the help of people like you. 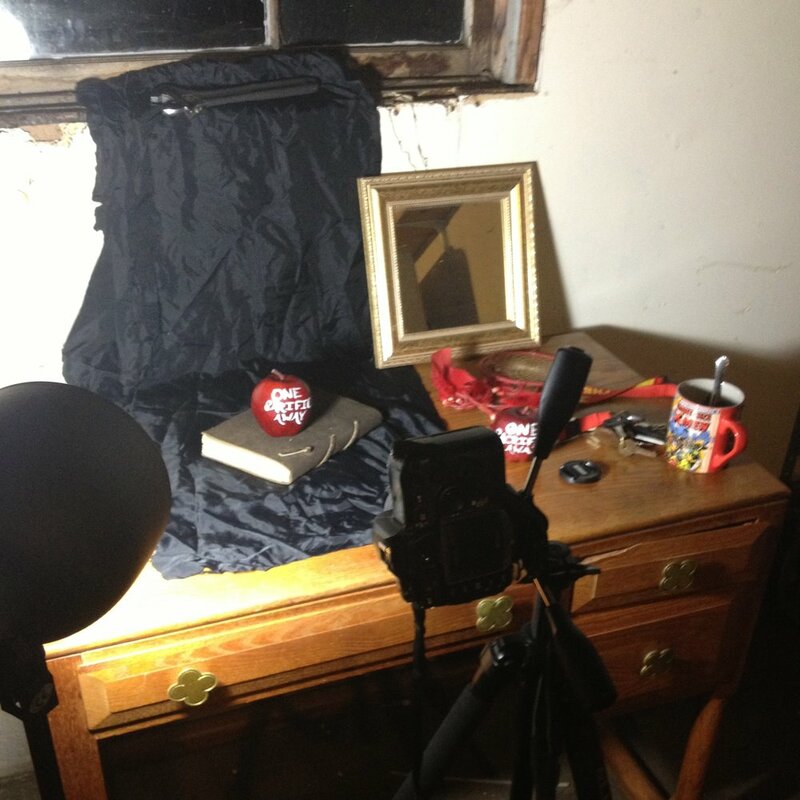 If you’ve enjoyed this behind the scenes look at my artwork, if you enjoy the artwork, enjoy Tell City, or if you just believe in supporting independent artists and authors, please consider sharing this post, buying a book or some swag, or for an even more in depth look behind the scenes, consider supporting Lusicovi Creative on Patreon. Learn more about that here. See, on the Amazon studio days, we have scheduled 15 minute breaks. And I am not one for whom idleness is tolerable….almost at all. I’m seemingly incapable of just sitting for 15 minutes. Occasionally you chat with coworkers, but even while chatting, my hands usually itch for something to do. So I started bringing in crossword puzzle books, and then my sketchbook. Specifically, at some point in my early art school days, I had obtained a small simple black 5x7 or so sized sketchbook. It was half filled. And then at some point in school I started using bigger ones and so this half empty book just was there on my shelf. Until one day last January, I grabbed it on my way out the door. When I had downtime that day, I flipped through to see what was in the book from the years and years before. Browsing partly out of curiosity and partly out of a search for something else to do, I came across a series of pages that contained only stark outlines of varying shapes- a wine bottle, a leaf, an apple, etc. I came to the page with the apple and decided, for fun, to shade the apple and fill it in. So I grabbed my pencil and did that. By the time I had added the dimension to the apple, it reminded me of the Tell City cover apple. As an added touch, I inscribed the classic Tell City phrase, “One Sacrifice Away.” But I still had time to kill. So I continued with my Tell City theme, and added an arrow piercing the apple, in classic William Tell fashion. 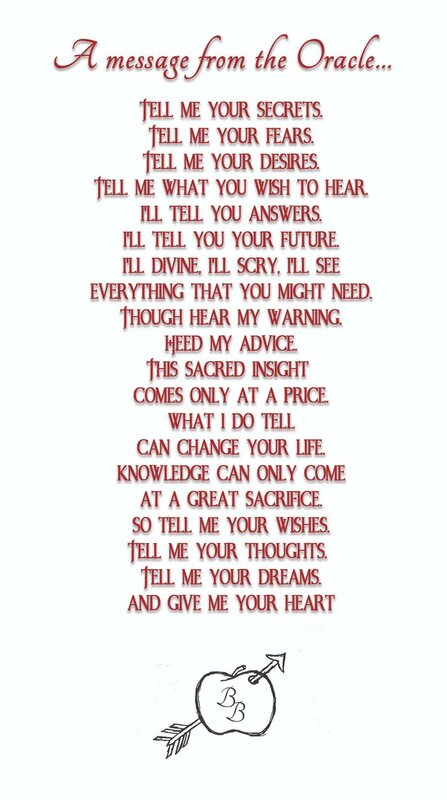 These lines (also featured on the back cover of the hardcover dust jacket) have always been some of my VERY FAVORITE lines, not just of Tell City, but possibly of all fantasy writing. They manage to evocatively echo and reverberate both backwards and forwards in time, calling up many ancient myths, and also pushing forward into the unknown misty landscape. The part that evokes Snow White in particular, combined with the imagery of a reflection in a well (which would naturally ripple) has always appeared in my imagination as a rippling mirror, that blurs the lines of surrealism. Is it a mirror? Is it water? Is the apple floating? Or reflected? Or all of the above? So, with my favorite “One Sacrifice Away” quote swirling around in my mind, I added a rippling ornate mirror to the background of the now definitely Tell City fan art piece I had stumbled my way into drawing. I actually had originally envisioned adding a light shadowy panther’s face into the mirror as well, but I ran out of time. 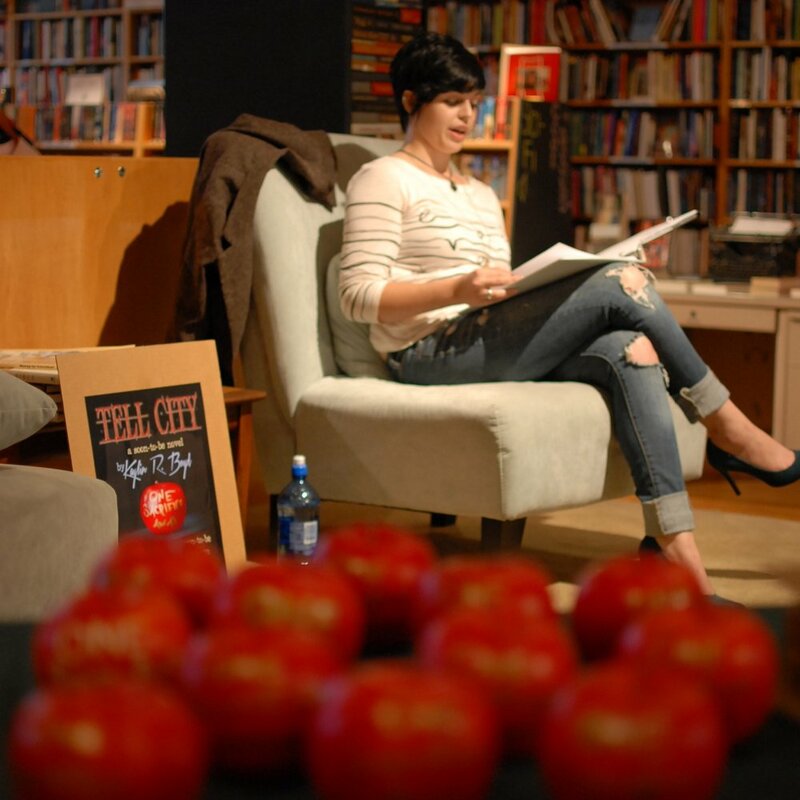 If you have a copy of Tell City (and if you don’t, get thee hence to Amazon and grab a copy! Or click here. ), you know that this drawing wound up in the intro pages to the novel- a thing of which I am immensely proud. I might actually even be more honored to have my artwork featured inside the book than to have my designs on the cover. “Cover designer” is a thing I am certain I am good at. I love doing it, and I’m confident in my ability to craft magical and enchanting book cover designs. “Graphite realistic surreal fan art drawer,” on the other hand, is something that surprised me. I hadn’t hand drawn anything in graphite in a long long while, and even in the heyday of my art school days, I was never particularly quick or skilled with realistic graphite drawings. I could manage it, usually, but it was always a struggle. This piece, however, just seemed to flow from my brain to the pencil to the page with unprecedented ease. Perhaps it was the reward for my sacrifice of not having my phone that day to waste time scrolling on…. Aside from being featured in the book (or perhaps, because it is featured in the book), when it came time to design Tell City merch, including this drawing was a bit of a no brainer. By that point, we had already paired the apple drawing in the front of the book with the poem that was a message from the oracle, and so as a bonus, all of the merchandise that has a back, features that poem on the back as well. And so, aside from having it in your copy of the book (Again, grab that here if you don’t have it already!) 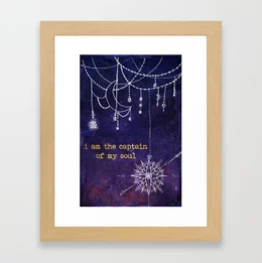 , you can also get this enchanting drawing on virtually any home good product or accessory you can image, or in a print. (If you want a signed archival fine art print, send me a message here- otherwise grab one printed on demand at the shop!) My personal favorite are the leggings! Hopefully it resonates with you the same way it does with me. 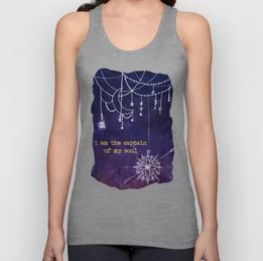 You can support this blog (plus a local independent author) by purchasing and repping any of the products in the shop here. Or by buying the novel here (and share your reviews with us on social media!) You can also support this blog and my general creative endeavors and musings by becoming a Patreon supporter. Learn more about that here. Thanks for stopping by! 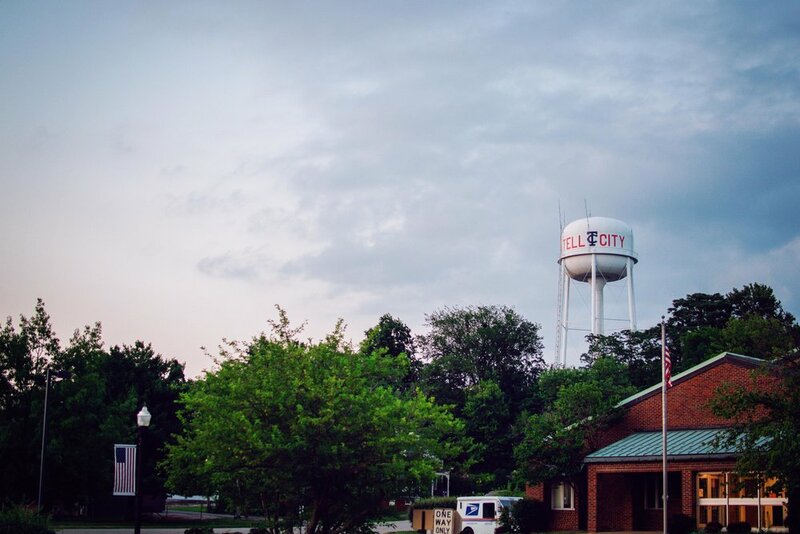 If you didn’t catch the long version of the story of Tell City, hop over here and read it now! I thought it might be cool to share the simple visual progression of the Tell City cover, from August 2013 to November 2018. Enjoy! And feel free to ask any questions in the comments if you have them! The first ever cover sketch from August 2013. And a few pages later in my notebook, from a few months later, during a night of art making and listening to Kay read from the book. 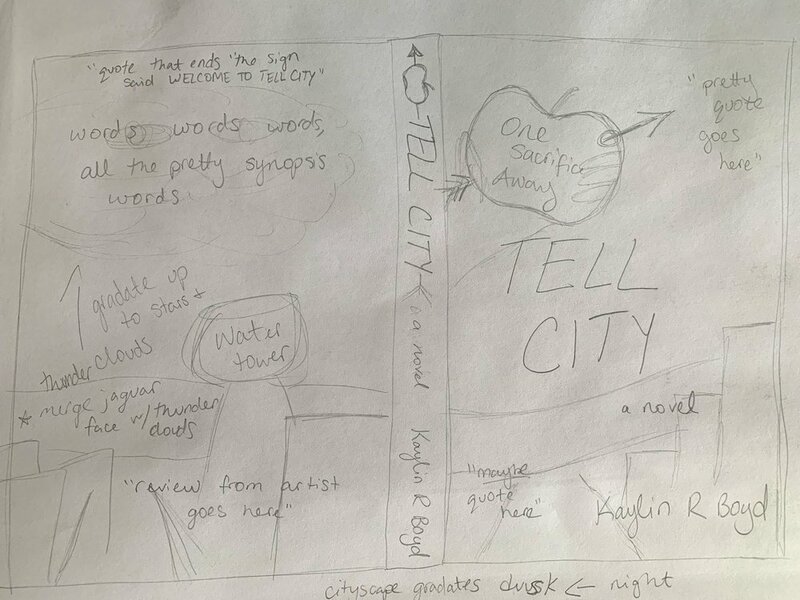 The first ever Tell City cover design. And the event poster that went with it. The most recent sketch of the full Tell City cover spread. The first version of the newest cover, obviously it still had a bit more evolving to do. The final front cover design. The final entire hardcover dust jacket spread. The back of all the shirts. You can also support this blog by contributing on Patreon. Learn more about that here! And support Kay by buying the book, below! The Sign Said "Welcome to Tell City...."
It was 2013. I had just moved to Indianapolis by myself. I had just signed a lease on a new apartment. I had just lost my job. I had just put together that my love of books and my love of making art could be combined in book design. I had just read a fantasy book (The Night Circus, by Erin Morgenstern. 10/10 would definitely recommend!) that had reawakened my creative spirit in the midst of all the massive chaos and fearful uncertainty that had been my life for over a year. And the ad for the book poster design had likened the book currently being written and in need of advertising to Neil Gaiman, whose books I adore. I responded to the ad. I believe I mentioned my love of Gaiman. The author and I went back and forth for a bit and decided to meet up at the local Noble Coffee & Tea. I had no idea what to expect. I had no idea that I was about to meet my best friend. The first ever sketch from 2013 of a Tell City cover. We met up in August. I remember we had chai tea lattes (Noble Coffee & Tea has the best chai tea lattes! ), and we sat outside and talked about our mutual love for Neil Gaiman, among other things. Kay told me about her book, which still only had 4 chapters written, and she didn’t know yet where the story was even going for sure, and I told her about my art. 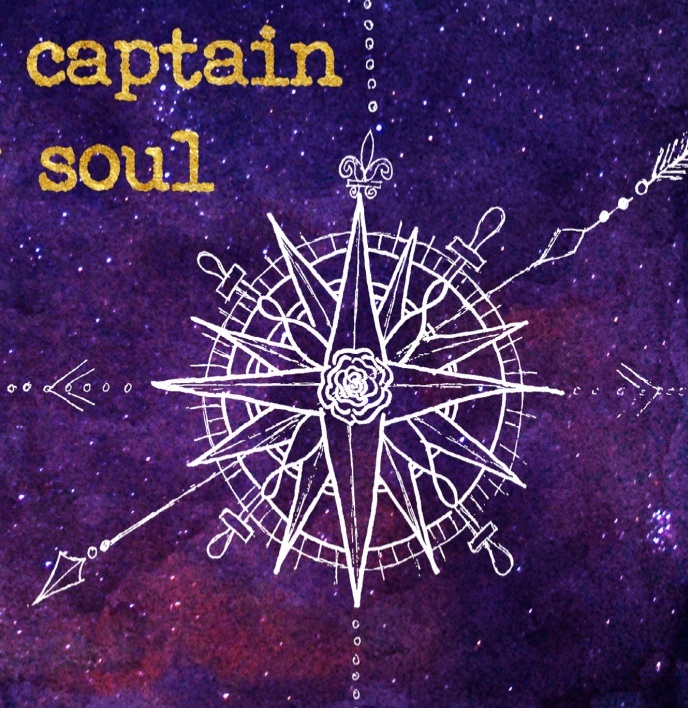 She told me about how she was trying to be smart about it, trying to get ahead of the marketing and build an audience for her first novel as she wrote, so that when it was finished there would already be people eagerly awaiting its release. So she was planning a book reading at Indy Reads Books, and needed posters designed to advertise the reading. 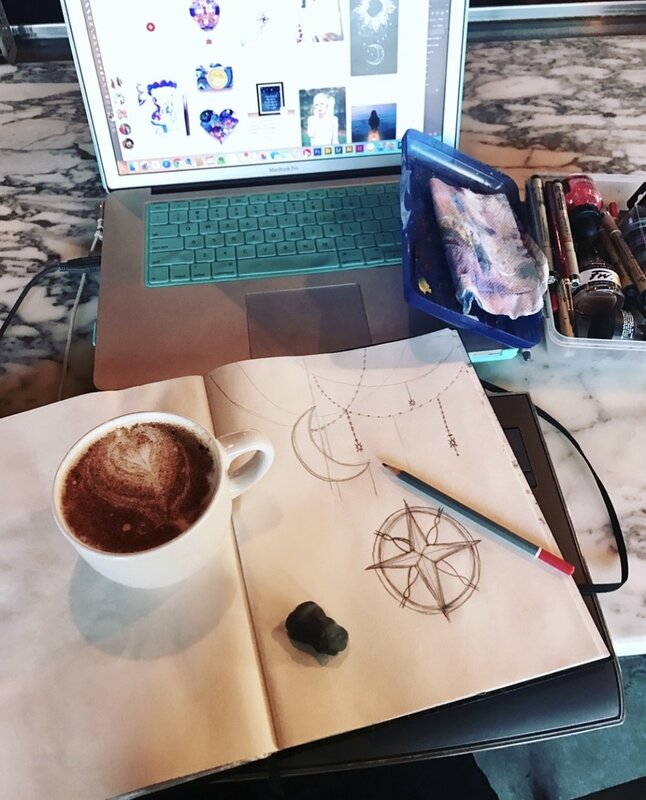 I had my sketchbook with me, and by the time our meeting was through, I had sketched out a rough design for both a book cover and for posters. I think we were good friends from that instant on. To complete the circle and start another one, in March of 2018, Kay and I took a road trip to Cleveland, Ohio, to see Neil Gaiman speak live. (!!!!!!) By then she was already writing her next book, and the Cleveland trip was actually a strange but brand new return to our normal method of writing and making art. But I’m getting ahead of myself. Some of the best moments from the Cleveland trip-including a horrendous quality but amazing photo of Neil himself, and two of my favorite ever photos of Kay. So back in 2013, we designed the posters. 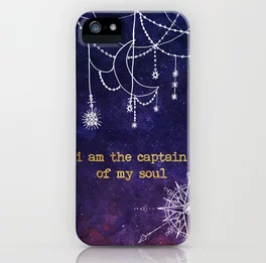 The design included an apple that had written on it “One Sacrifice Away;” a line from the book that we both loved. We did a photoshoot at her house to get an image of that apple. It also featured her leather journal that she sometimes wrote in. And while we were making the fake apple, Kay had the brilliant idea to make everyone who was coming to the reading their own fake apple with the prophetic words. So we made a whole bushel of apples. And we made bookmarks. And we stayed up until stupid late hours at my apartment and at Kinkos getting everything prepped for the book reading. And then when she sat on stage and read from her book, I and all of the other attendees fell in love with the story of Charles D Garrett and his prophetic dreams…. Over the next three years, Kay and I would get together whenever our schedules allowed for “Art Retreat Days,” which basically just meant her writing Tell City, and me working on whatever painting or photo editing or other creative project that I was currently working on. Often while I worked on my project, Kay would read aloud to me the latest in the adventures of Charles and his quest to Tell City. It was simply magical. One year (I think it would have been 2014), Kay had just happened to have been planning a “Tell City Reading get together” by coincidence on the evening of my birthday. I honestly couldn’t think of a better way to spend my birthday than that, so Veronica, Harrison, and I grabbed wine and cupcakes from the grocery store and headed to Kay’s house in Speedway. A small group of us gathered around her living room and fire pit, and took turns reading from the half completed manuscript. I’ve never experienced a party like it before. Everyone was in rapt, attentive silence. This book is just that mesmerizing. That memory is quite possibly my very favorite birthday evening ever. In the fall of 2016, the first draft of the novel was, unbelievably, done. Meanwhile several people had been telling me that they had just gone to Savannah, Georgia, and that I needed to go because I would love it. My birthday was coming up. I wanted to go on a road trip. Kay and I had been on a couple of short midwestern road trips at that point. And Kay had an entire novel to read through and edit, a task in which I was eager to participate. So we wrapped it all up into one jam packed extended weekend trip. We left from her house at 3 in the morning, drove to the middle of nowhere Indiana and paused to take photos of the stars, and then continued on our 18 hour drive to Savannah. Whoever was not driving was reading aloud and making notes in the printed manuscript. One day I’ll write a post about that trip alone, because we did SO much that it would be egregious to detail it all right now. But suffice it to say that it was a lovely, adventurous, magical trip. The city of Savannah definitely has my heart. And I learned that the combination of reading/editing and traveling/exploring new places is perhaps my very favorite thing. The second night we were there it rained, so instead of shooting more astrophotography in the purple area of the map that we had passed through on our way into Savannah the night before, we stayed in the Airbnb camper, and we spent hours meticulously crafting beautiful scenes in Tell City about poison and a falling coffee cup. About 6 months later we did another weekend Airbnb retreat, this time with Kay’s sister as well, and this time in Indianapolis instead of an actual road trip. Basically, we holed ourselves up in a nice place for a weekend and just went through the novel again from start to (almost) finish. And while we did that, I painted. Sufficiently edited, Kay began querying agents and publishers, hoping that someone would pick up Tell City, and I turned my attention to other creative pursuits, one of which eventually became The Starlight Journal. 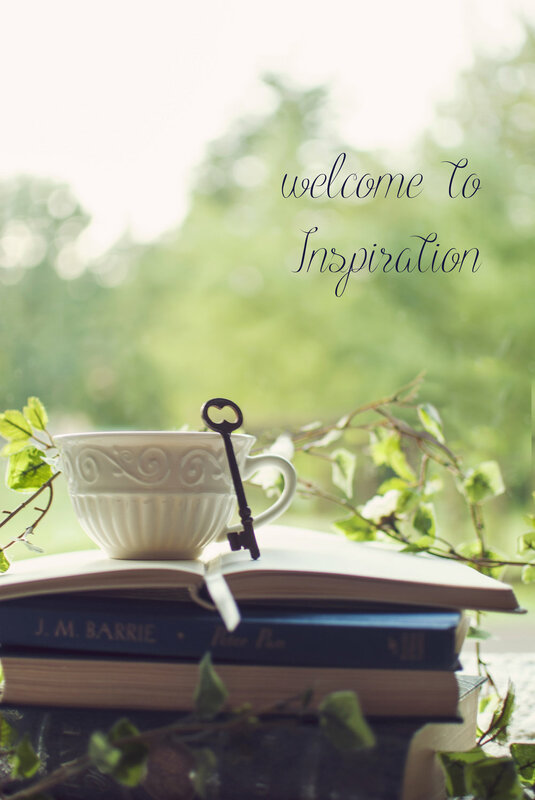 By March of last year, Kay had decided to self publish, a tough decision which I ultimately loved because I saw it put the spring back in her step. Where she had been worn down and discouraged after months of rejections, suddenly she was reinvigorated. So we set about turning a google doc novel into a physical book. Now, I had had a sketch in my sketchbook from almost immediately after we did the first cover/poster design project, of a much more elaborate cover for Tell City involving the same cover apple floating in a flooded main street, one that I always envisioned as the actual Tell City, Indiana. We had tried a time or two over the years to at least take the underwater photograph needed of the apple, but for one roadblock or another we had never made it happen. And since publishing houses almost always insist on using in house or their own designers, there was never much need to create a true cover. Until now. So I dusted off my years old sketch book and found that original sketch, and then we went on a trip that ultimately improved upon the concept in ways we hadn’t even imagined. The most recent sketch of the Tell City cover spread. For this cover design we needed: An underwater photograph of the apple, and images of the “skyline” such as it was of the actual Tell City. We had also been talking about taking a trip to Tell City just in general anyways, because I had never seen the real town, and because somehow along the way, Kay and I became adventure partners; and clearly this was an adventure we needed to have. And, well, boy did we. After a trying round of dueling schedules, we finally settled on the last weekend of June as our available time to make the trip to Tell City. We planned to set off late at night on the Friday, and arrive in the wee hours of the morning and check in at the same hotel that Charles does when he first drifts into Tell City in the book. This we did, driving through the winding back country roads of Indiana in the foggy dead of night. We saw/almost hit I think at least 4 different animals on the road, which Kay took to be a good omen, since the animal spirits in the novel also frequent Charles’s path. You know what they say about the best laid plans, though… when we arrived at 3am at the Day’s Inn, we discovered two things. One, it was no longer the Day’s Inn, now it was called the Knight’s Inn (oh, irony), and two, the front office was most definitely closed. We could not check in. So we scrambled on our phones to find another open hotel, and wound up in one high on a hilltop overlooking a good part of the highway and some neighborhoods. Southern Indiana is gloriously hilly. As an added bonus, this hotel had a pool, which was just what we needed for our second part of the photoshoot. Finally settled we collapsed into bed and slept a few hours. The next morning, we formed our game plan over complimentary hotel breakfast and coffee: first we would go into the town proper and just explore to get the lay of the land, and have lunch at a local place. Then we would come back to the hotel in the afternoon and do the pool photoshoot to get the underwater photo of the apple. Then we would have dinner and at dusk head around to all the spots in the city we wanted to photograph for the cover “skyline” shots. We had a lot of fun exploring the main street shops local eclectic houses, the water tower that is infamous in the book, and the flood wall and river park. It was especially fun assigning different locations as “Amanda’s house” or “Desiree’s shop,” places that are featured in the book. The book’s geography is based on the real Tell City, but necessarily takes some liberties and plays with the topography a bit. But even so, it was exciting to see the previously fictional place come to life, as it were. As we went we photographed “Steve the apple” (the original cover apple) on a tour of Tell City. In my sketch and in my head, I had always envisioned capturing the main street from a bit of a hill, but of course, when we got there, the actual main street was as flat as a corn field. So our skyline task for the day mostly involved traipsing the hills around the main street to find a sufficient vantage point that would look main street enough. We took lots of photos at many different vantage points and at a few different times. As dusk was falling and the deep purple blue of true night was settling in, we happened to be at the top of one of the hills, taking a long exposure shot down that hill towards the river, and for whatever reason I happened to look up. I was immediately astonished. 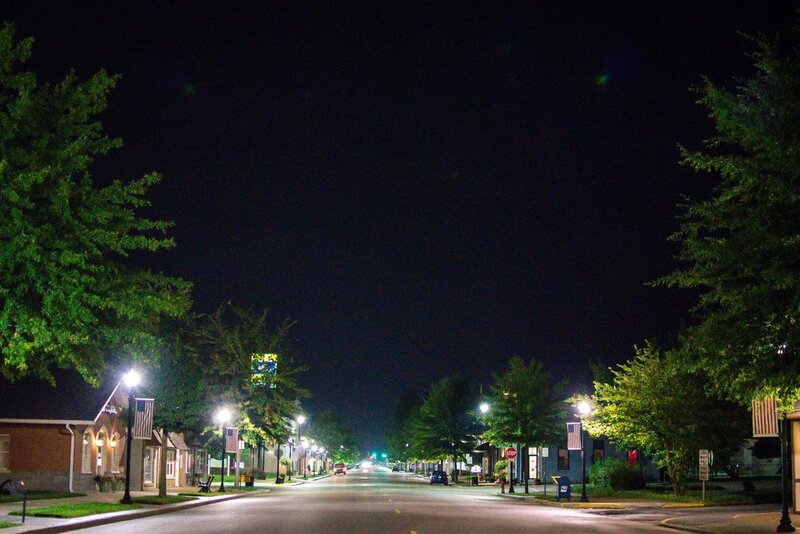 I have always lived in proper cities, and Indiana especially has very bad light pollution in most of the state, so other than our brief drive to Savannah in 2016 (during which we regrettably did not stop for pictures! 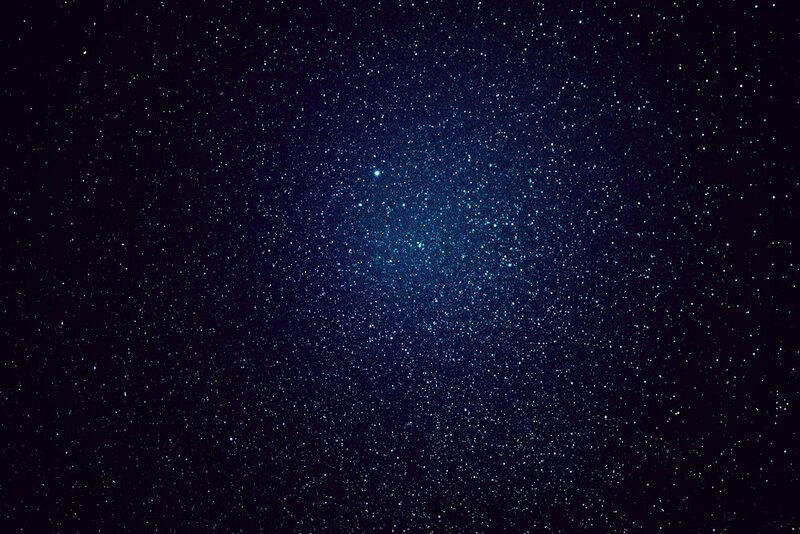 ), I had never seen so many stars. But what was more, it was a perfectly clear night. So I pointed up to show Kay, and also pulled out my phone to check my Dark Skies app and see if we were currently actually in the purple. (Quick side note- I have an app that maps the whole world based on light pollution. Almost all of Indiana and the east coast is level green or higher, which means you barely see any stars. Purple is the next step down, and is the only place you can even hope to get to without going truly out west. So “take star photos in the purple” has been on my literal bucket/goals list for several years, and every time I tried up until this point, it had rained.) We were not in the purple, but I quickly noticed that just on the other side of the Ohio River, right across the border in Kentucky, was a small splotch of purple map. I imagine that the look on my face said it all, as I turned to Kay to ask if we could go. She laughed at my giddy childlike enthusiasm and agreed of course, even though it was already almost 11pm and we were both exhausted. So we packed up the car, stopped at a gas station for snacks and caffeine, and just before midnight, headed across the Ohio into Kentucky….right into a thunderous rainstorm. Now, I have had a few treacherous drives in my life. And driving through unknown narrow roads in the rolling hills of Kentucky after midnight in a torrential downpour is not THE most terrifying drive I’ve ever done….but it’s in the top 5. It got so bad at one point that we had to pull of the road into a farmhouse driveway just because it was raining so hard we couldn’t even see the road. At this point we also pulled up radar and maps and tried to determine if it was even worth it to keep going or if once again, my efforts to photograph the stars in purple were to be thwarted by unceasing rain. We eventually and optimistically decided that, well, we’d already come this far. And it looked like the storm was actually not going to be over our final destination. And the torrent was easing so that we could see again. So we got back on the road. Luckily we had passed through the worst of the storm and the rain and clouds got lighter and lighter as we drove to our destination- a random strip of road in the Kentucky almost mountains. We finally pulled over and stepped out of the car and looked up…to see mostly clouds still obscuring the bulk of the stars, and a very very bright moon that we hadn’t considered. It was disheartening, but we had come this far. And it was still pretty enough, and I had some fun light props with me, so we figured what the hell, we could still get some interesting shots, even if they weren’t milky way photos. 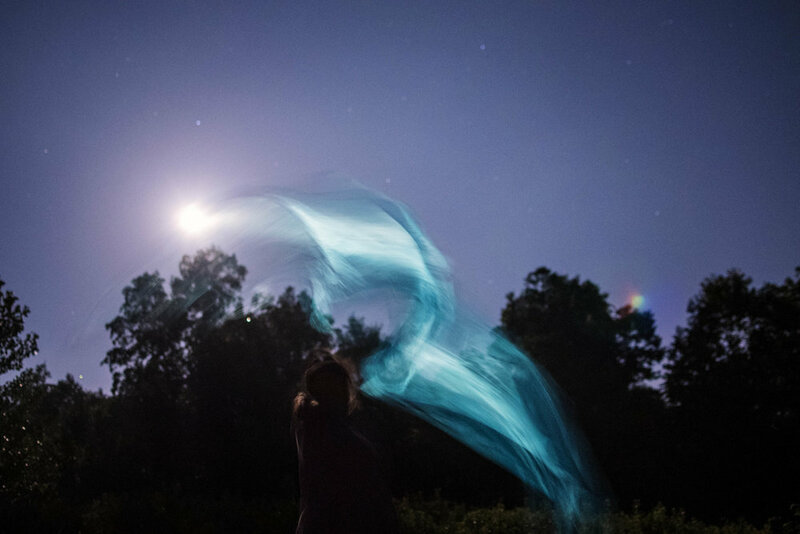 So we did that, Kay manning the camera button and I dancing with silk fans and flashlights and glow sticks in front of the long shutter and under the bright light of the moon. Those photos are definitely magical, but the true magic was yet to come. 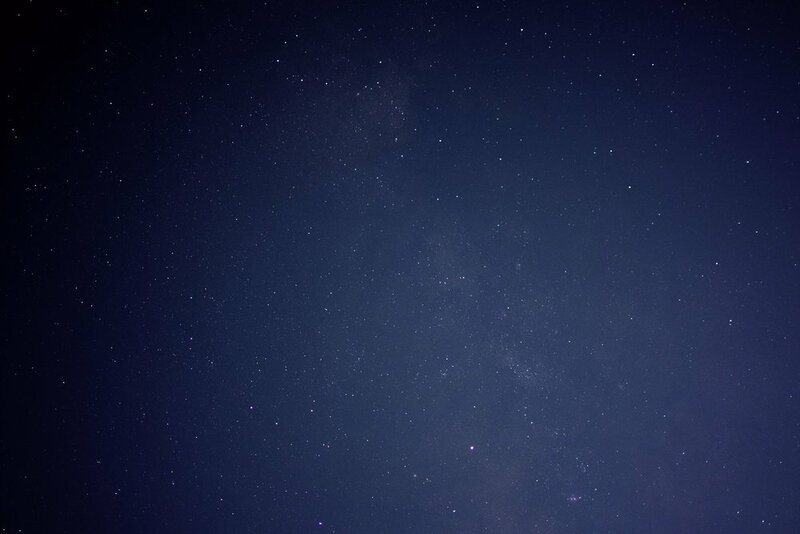 After a relatively short time, we noticed that the clouds were starting to dissipate, and we could definitely see more of the stars. Trying to determine the best viewing spot, Kay laid down in the middle of the road at one point and pointed up. “The milky way!” She exclaimed. Sure enough, there it was, beautiful and bright. A bit too bright, with the moon shining directly at us, but we took what photos we could anyways. Eventually the animals in the nearby forest started making enough noise to spook us, so we nervously packed the car back up and headed back out to the main road. At one point one of us jokingly said a prayer to Thor, god of Thunder. Then Kay implored Loki and strangely enough, just as she did, there was one quick flash in the distance. Almost like they were laughing at us. I missed it on the camera (mostly because I hadn’t expected it to work! ), but it gave me an idea. I pulled out my phone, and through the glorious wonder of the internet, played AC/DC’s “Thunderstruck” on Youtube. To our utter delight and amazement, the first time the band says “Thunder,” the lightning flashed, and this time I was waiting for it. We danced and laughed and sang the whole song, taking photos of the lightning in the distance all the while. At the end of the song, figuring that it really didn’t get any better than that, and noticing both the hour and the mist starting to roll into the valley we were in, we finally called it a night and headed back towards Tell City and our hotel. We slept in late the next morning and, having gotten everything we came for and much much more, we finally headed for home. 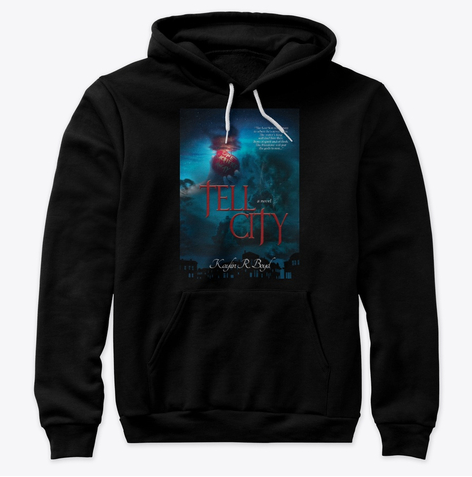 I created the cover for Tell City from the photos we got that day, including the milky way shots and the storm, then we turned to the interior and all of the other marketing and planning efforts to launch a brand new book. Seven months later and the physical books are out in the world, generating posts on social media from old friends and new fans alike. It’s strange but wonderful seeing the cover artwork, and the book, which is not only a truly wonderful and magical story itself, but which has so much magic wrapped up in the creation of it, and which is so dear to my heart, going out and making its own way in the world. Wandering, if you will. As must we all. 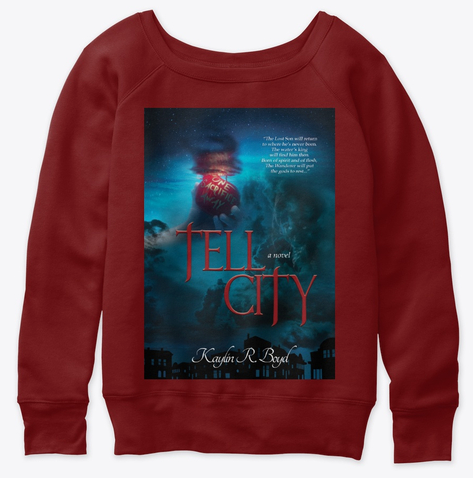 To read the enchanting novel, Tell City, by Kaylin R Boyd, and thus support both an independent artist and an independent author, click here. To learn more about Kaylin R Boyd, click here. To support this blog, share this post with other book loving friends, and consider becoming a supporter on Patreon. Learn more about that here. So, I have a confession. I’ve never used a bullet journal before. 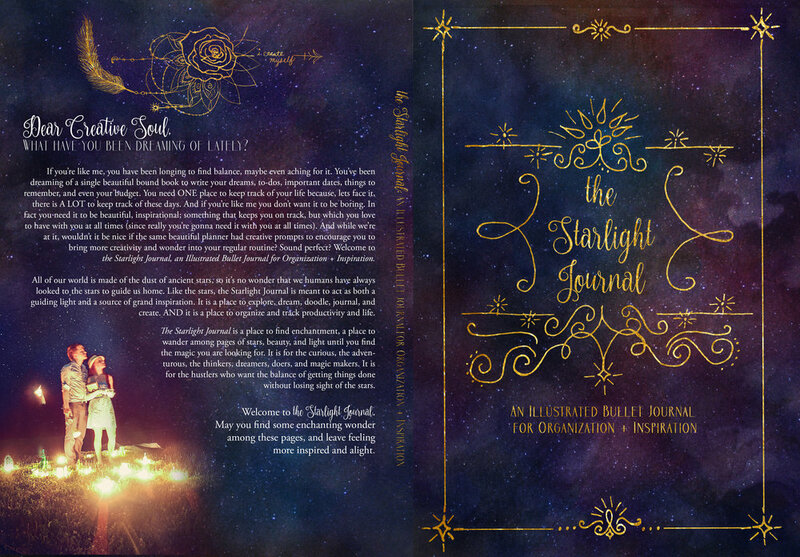 Or rather, I didn’t use a bullet journal until I got the first proof copy of the Starlight Journal. Which rather begs the question, why did I make an illustrated bullet journal for myself? And the answer is a bit convoluted, to be honest. And it starts three years ago. Three years ago I went through a mindset bootcamp program, of sorts, in an effort to figure out how the hell this thing called “adulting” works. I felt (like most people probably feel even still) that I had absolutely nothing under control, and didn’t know how to do anything. I had a job that I basically loved as a full time product photographer, but it didn’t pay me enough to even keep a budget. Because the math just could not work. There wasn’t enough. I was overdrafting my bank account regularly, trying to keep to a shoestring budget, and paying too much in rent and in debt repayment. I was single and lonely and I knew it was all wrapped up together, because who would want to even be with someone who was so much of a mess? I knew that something had to change but I had no idea what or how or where to start. Enter something called the Dating Mindset Bootcamp, which was really not very much about dating and was very much about how to be in your best mindset for your best self. Going through the Bootcamp taught me for the first time about masculine and feminine energies and how we need to balance BOTH to have a good relationship with ourselves and therefore with others. If you have absolutely zero structure (masculine), then you are nothing but chaos (feminine), and while we do need some chaos to keep growing and to keep life interesting, too much of it is just as bad as too much structure and order. The other thing I learned (or learned to see in a different light) was that I was waaaayyyyy chaotic. Like, the thing is that I am a pretty feminine person. I love dresses and frills and flowers. I love art and beauty and love. I’m obsessed with water, which is archetypically associated with the feminine in almost every single instance. I’m clearly very artistic and creative. I love arts, music, dance, and anything that flows. I’m terrible at time (which is very masculine), I’m SUPER emotional. One of my best friends astutely proclaimed one day on the phone that I “just feel almost everything profoundly,” and I think that’s 100% correct. It’s amazing some days and terrible other days, and it makes me very empathetic, loving, patient, and kind. All of these are good things. But being terrible at math (so, finances), and being terrible at knowing how time works, and having emotions so strong that they can take over my afternoon is often not so good. This is a long story, my friends, so I'm going to pause here for now. Stay tuned for the next blog post to read on!